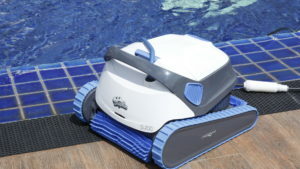 Moreover, size of pool equipment and accessories depend on its surrounding and floor area. Lastly, installation of quality filtration and septic systems will reduce the amount of chemical use and generate clean water in a short time. Freeform is a swimming pool that has no limitation on the shapes. It can be built in any shape and form for aesthetics and suitability to the surrounding area. Most freeform pools utilize over flow system and are compatible with every water sanitation system (fabric filter/ sand filter) (salt / chlorine / UV / ozone). 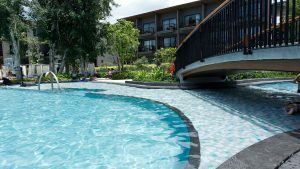 Overflow is considered the pool with best water circulation, as water surface is overflowing at the pool edge all the time. The feature helps keep water surface clean and clear. It circulates water from the bottom of the pool, pushes it upward and overflown to the gutter and eventually the water tank. It is considered the best circulation system. Overflow pool can utilize every water sanitation system (fabric filter/ sand filter) (salt / chlorine / UV / ozone). 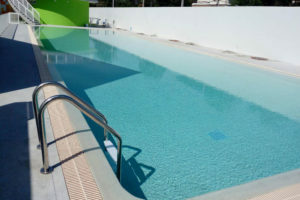 Skimmer pool is specifically for users with limited space, as it does not require a water tank. 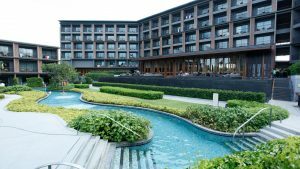 Water surface will be 15 – 20 centimeters below the pool’s edges to keep water in the pool when people enter the pool. For the most effective and comprehensive water circulation, the water pump and water suction are located on the opposite sides. Skimmer pool can utilize every water sanitation system (fabric filter/ sand filter) (salt / chlorine / UV / ozone). 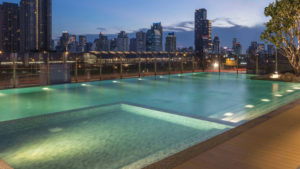 Infinity Pool is one of the most popular pools today, as the gutter for the overflown water is located at the bottom, hiding both the gutter and the pools’ edge. Swimmers will enjoy the sense of freedom, limitlessness, and aesthetics. It circulates water from the bottom of the pool, pushes it upward and overflown to the gutter and eventually the water tank. It is considered the best circulation system. Overflow pool can utilize every water sanitation system (fabric filter/ sand filter) (salt / chlorine / UV / ozone). 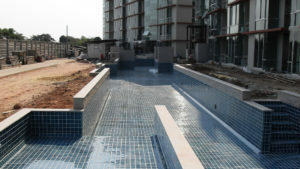 We promise to deliver the highest level of quality construction services for creating Lifetime pools for our clients. We brought in an innovative concrete manipulation technique to achieve a seamless 1-piece wall-to-floor pool that will not crack or leak. 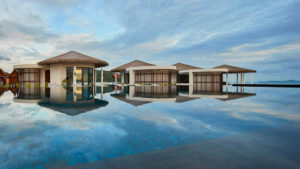 Together with a set of 21-26-meter-deep steel foundations this pool is sure to outlast any other in its category. Swimming pool is a durable product, making the concrete pool the best solution with its strength and durability. 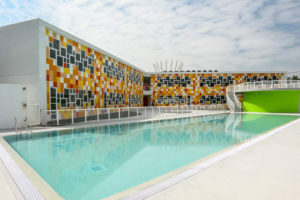 With effective planning that takes surrounding area into account, the concrete swimming pool will be with the building for a long time, without any collapse and leakage. Concrete pool can be built in various forms and depth. Various features can be added to the pool, while both skimmer and overflow options are both available for the pool surface’s selection. Both fiberglass and concrete pool uses liner as a leakage prevention method. While liner can be used for pools of different sizes, it has limitation in the shapes and depths of the pools. 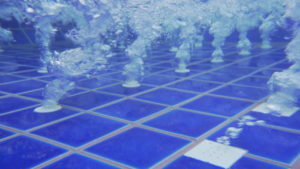 Liner pool is also less durable than concrete pools, as it can tear and create holes in the lining. Liner pool often utilizes skimmer system. Fiber glass pool is an instant swimming pool. It comes in ample sizes. However, it often poses limitation on the logistics. It often utilizes skimmer system. Common features, such as water therapy system and swim jet, are often added for more comprehensive usage. Installation of pool systems is one of the most important parts for of pool construction. With high standard water pipe system installatation will help extend lifetime of your swimming pool and reduce maintenance expense. .
Spa system is one of the must-have functions for swimming pool. It helps massages for muscle relaxation. It can be installed on one side of the pool. If the pool has differing depths, it should be on the shallow and separate side. The appropriate depth is 90 cm. 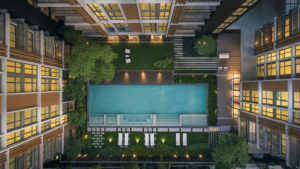 In addition, the spa pool can use the same water treatment system as the main pool, however, if the customers would like to install water heating system as well, the water treatment system must then be separated to maintain water temperature and save electricity cost for water heating. The stream-like swimming pool often forms ‘Lazy River,’ which uses similar water treatment system to other pools in general, but requires a large water pump to push water into the same circular motion direction. Usually, temperature control system is also installed to keep users warm, while they enjoy letting themselves go downstream. Additionally, they can also walk or swim counter-current for exercise. The underwater light is another must-have equipment in the swimming pool that can add excitement to any night swim. The underwater lighting can be warm, cool, or color-changing lights. 12V current is used, so that it is safe for users. For those who like music, underwater sound system is another item that can add serenity to your swim. The materials are specially designed for underwater installment and quality sound system in the water. Currently, there are three types of swimming pool filters: DE filter (fabric), sand filter, and cartridge filter. DE filter traps any particles of up to 1-5 micron and must be accompanied by filter powder. Maintenance can be difficult, as the filter must be removed for cleaning regularly. Sand filter was originally and solely used with sand filter materials, making the filter less effective than DE filter at about 10-15 microns. However, today, there are new filter materials, such as Zelbrite and EcoClear that can be used with sand filter, increasing its effectiveness to the filter level of DE filters. Additionally, maintenance is much simpler, hence its popularity today. Cartridge filter is suitable for smaller swimming pools. It can trap the excess of 1-5 microns and must be accompanied with filter powder. The maintenance is troublesome, as the filter must be removed for cleaning and its filter is not as durable as DE filter’s. There are 4 different types of disinfection systems for swimming pool: salt, chlorine, ozone, and mineral water. Salt system is a system where salt water of 4,000 ppm concentration is passed through electrical currents to separate and produce chlorine gas for disinfecting swimming pools. However, the produced chlorine is not concentrate enough to make the water clear, therefore, chlorine may be added when adding new water into the swimming pool to maintain the quality and clearness of the water. Chlorination system utilizes chlorine as the main chemical in making the water clear and disinfecting the water. However, putting excessive chlorine into the water and incorrect use of chlorine, including using contaminated chlorine, may lead to allergies. There are two chlorination systems: manual and auto feed. 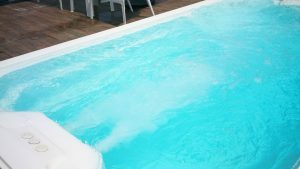 The first requires users to add chlorine manually, hence there will be no installation system expense, but chlorine count in the pool may not be consistent. The latter uses machine to automatically add chlorine to keep chlorine count consistent, but it incurs more costs. Each pool requires 300 grams of chlorine per 100 sq. m. of water. Ozone system incurs higher installation costs than other systems and has limitation in installing the equipment, as it must be in the dry and cool area and away from acidic chemical. The ozone disinfects and disappears, therefore chlorine is still required at a smaller amount, while keeping the chlorine count standard. Post-sales service is consisted of warranty and parts for maintenance to lengthen the pool’s life. We provide spare part for maintenance; including comprehensive pool cleaning services, repair and resurfacing. With extensive services and competitive pricing, we can help you look forward to more fun and less effort. In addition to equipment and parts for services, we also provide monthly swimming pool cleaning services. Our staffs can clean, scoop up leaves, measure pH and chlorine values, add chemicals, and check the equipment 2-3 times per week. For an older pool, some equipment may need a repair. We also provide a repair team to service customers both at our locations and at your pools. A good swimming pool is not the most beautiful or modern pool, but it is the most useful pool for users, whether they are children or elderly. It must be designed to fit the location, with good feng shui, while ensuring durability with strong foundation according to the engineering standards. 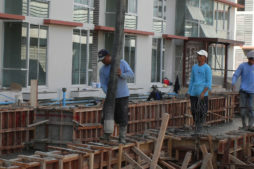 Walls and floor of the pool must be a one-piece work, without any seams to prevent leakage. Maintenance is also simple by locating equipment in a convenient manner. 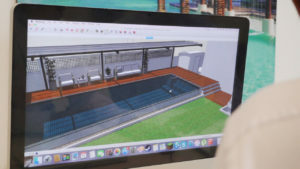 Equipment must also be selected to fit the type of the swimming pool. Selection of appropriate equipment to the type of pool and usage, including plumbing system, pipe types, and pipe sizes, is very important to reduce complication in maintaining the quality of the water, mitigating any future problem, and ensuring safety from chemical residue in the pool. 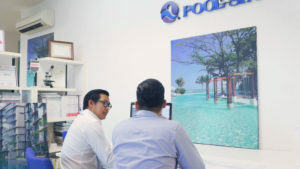 If the pool starts giving you troubles or has become dull and boring with its use cases and tile colors or simply needs a new water treatment system installed, we provide an inspection team who are ready to give you tips and advices for your concerns. Consult with our professional pool service agents. 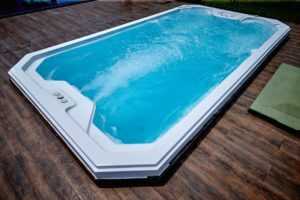 Because building a swimming pool is not a simple decision, nor it can be frequently changed, therefore, before building one, it is important to do some research and learn from the experts. Customers should also experience their selected type prior to the decision in order to build the swimming pools of your dreams.